The Sheep’s Head Peninsula has long been a magnet for people who want to get away from it all, to recharge their batteries and to find inspiration. Writers, artists, sailors and chefs have all fallen in love with the Peninsula over the years. For example, the novelist Wolf Mankowitz lived in Ahakista, while Booker prize-winning J.G.Farrell lived just a few miles outside Kilcrohane. In fact, he died tragically when he was swept off the rocks by a rogue wave while he was fishing not far from our house. I mention just some of the interesting people who have made their home on the Sheep’s Head because I discovered that Kilcrohane now has its very own resident world-renowned artist. Four months ago, Alex Chamberlain was looking for a house in Ireland. He had been to see many properties but nothing felt like home until the day he travelled from Bantry to Kilcrohane via the Goats Path. “We were making our way to Kilcrohane, when suddenly we came across an old house with some out-buildings and land just outside the village. We stopped the car and took a look around. That was it really; I bought the house that afternoon,” Alex told me as we sat in his kitchen surrounded by some of his paintings. I met Alex by complete accident after I went to buy milk at our local village shop. Alex had been living in Portugal for years where he had a studio. 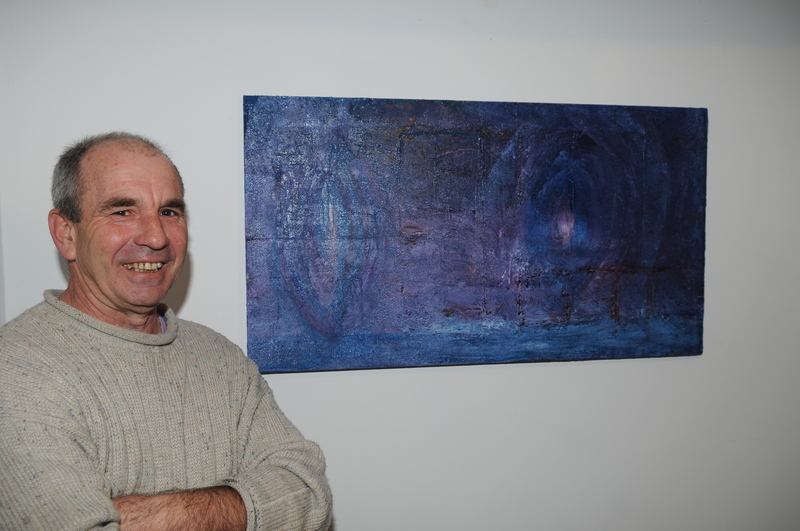 “I have been painting for many years now and I think I wanted something new, a new perspective, and I suppose a new challenge,” Alex said when I asked him why he had decided to live in Kilcrohane. 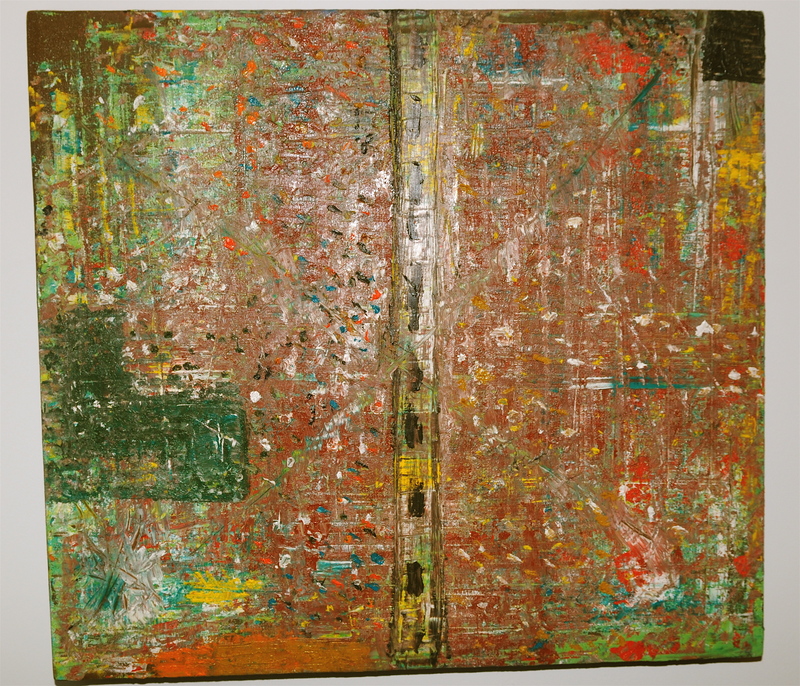 Having exhibited his paintings around the world, Alex said he was looking for a home with something special. “I couldn’t put my finger on what that something special was but when I arrived in Kilcrohane it just felt right and I still have that feeling today. I found inspiration not only for my painting but for something that I have long held a passion for,” Alex continued. Indeed, it was this passion that led me to Alex. 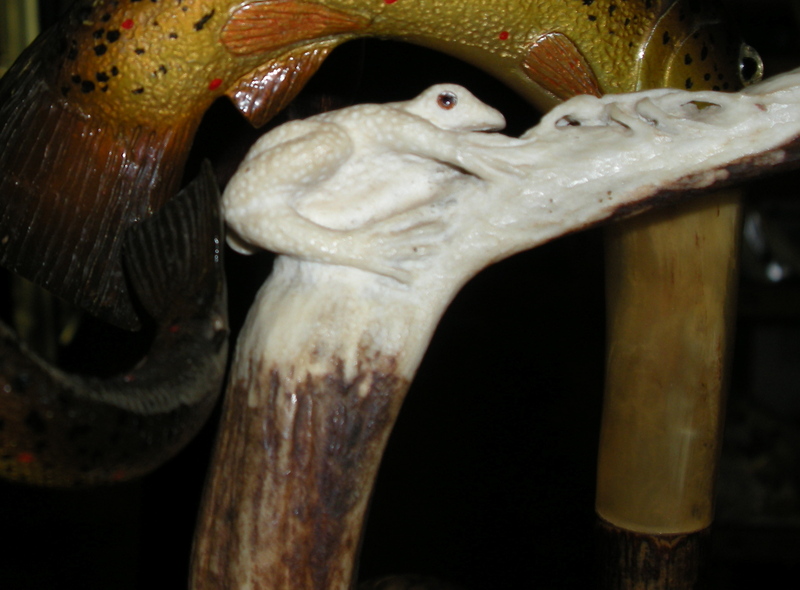 While I was buying my daily milk, I noticed a rack of beautifully carved walking sticks on display. Each stick had a different carved and hand-painted head. There were Pheasants, Trout, Salmon and a Frog, all hand-craved from bone and horn. “I learned to carve a long time ago. It’s just a hobby really but when I saw that the Sheep’s Head is very popular with walkers I thought I would put a few in the local shop, just to see the reaction really,” Alex said. 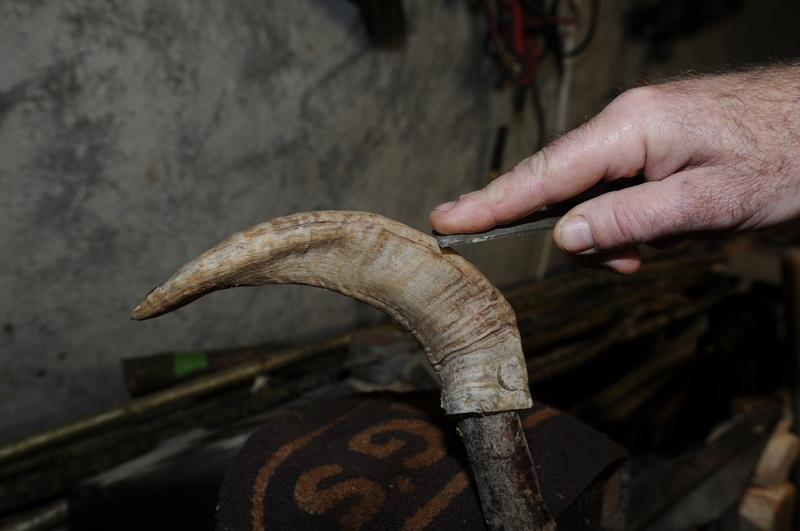 Alex uses rams’ horn and antlers, which many of his neighbours kindly donate. “A ram has to be at least five years old before you can use the horn for carving. There are also lots of Blackthorn trees in the area, which are perfect for the base of the sticks. I love using natural material that can be found in the area where I live. 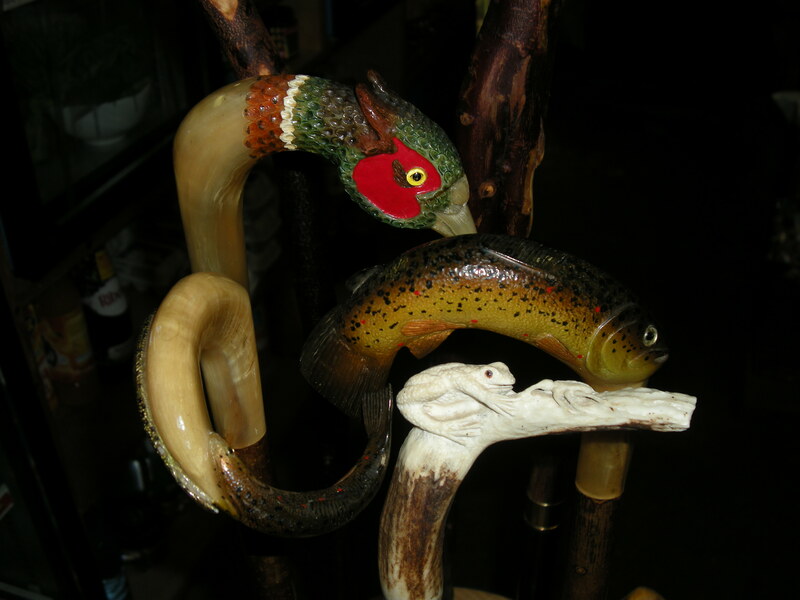 It takes a long time to carve but in the end you have a good walking stick that is a little piece of art as well,” Alex enthused. So, if you ever decide to go walking on the Sheep’s Head, stop off in O’Mahony’s Shop in Kilcrohane. There you will see little works of art by the Peninsula’s latest arrival, Alex Chamberlain. This entry was posted in Uncategorized and tagged West Cork, Artist, Ireland by Brian Moore. Bookmark the permalink.